Hello and Happy Sunday, friends! Today I have the pleasure and honor of being hostess at The Paper Players. 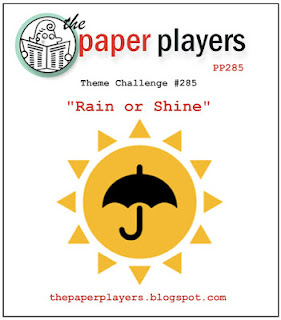 This week is a theme challenge, and I've chosen Rain or Shine as our theme. I was thinking along the lines of April showers and spring, though since we had snow this weekend here in the Northeast I guess that is just wishful thinking! I was also intending on being a bit more true to the sketch at Freshly Made Sketches this week, but that morphed too. I'm in landscape instead of portrait mode, my cloud bank is the horizontal element of the sketch, and the sunshine mirrors the butterfly element. 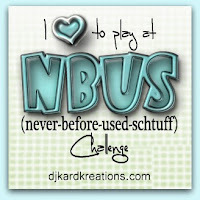 I'm also playing along with Darnell's NBUS Challenge, with my brand new Simon Says Stamp stitched rectangle dies. I cut the cloud bank twice, once in white and once in blue. It was a bit tricky to re-assemble, but not too bad after I decided to flip it over and hold it together with washi tape. Thank for stopping by, and please visit the rest of the team at The Paper Players! 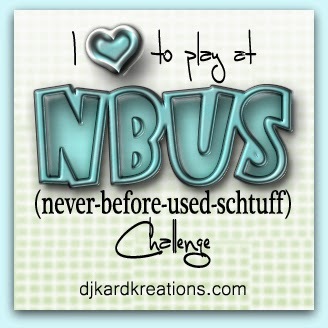 I hope you play along with my challenge this week, too! This card just makes me smile! So bright and happy! I love how you doubled the clouds.....worth all that extra fooling around! Crisp and cheery! What a fun, happy, cheerful card! Those cloud dies are amazing! I love that stamp set, too...wondered how you got that cute little sun stamped that way! Awesome challenge and awesome creation! Awesome card Sandy - I love those edged clouds and the pop of sun from the yellow and bright polka dot border. Such a cheerful sunshine card! What a great challenge choice this week! Sandy, this card is fabulous. I LOVE the edged clouds and the bright sun behind. Gorgeous. Oh.... yeah... my cards ALWAYS have a mind of their own. I'm never one that can plan a card. This is such a fabulous card! Love the really clean look and the details, but especially love the very creative way that you used the sketch. Thanks for sharing with us at Freshly Made Sketches! LOVE this!! What a fun and creative use of the sketch! Thank you for playing along with us at Freshly Made Sketches. I love when a card takes its own path...especially when it comes out this great! Love those clouds and your take on the sketch! So glad you joined us this week at FMS! Your sun looks so happy... love that smile! I really like those clouds too....need to put that on my wish list. Have a great week! Ok, it doesn't get better or happier than sunshine, happy clouds and polka dots! LOVE it all, Sandy, especially the cool double layered clouds. Such a fun theme! Sandy, this is fabulous! I love those clouds and the jolly sunshine! Polka dots and happy colors--my kind of card! Sandy, this turned out awesome! I love those clouds and the color combo. Congrats on this one being chosen as one of the winners at FMS. 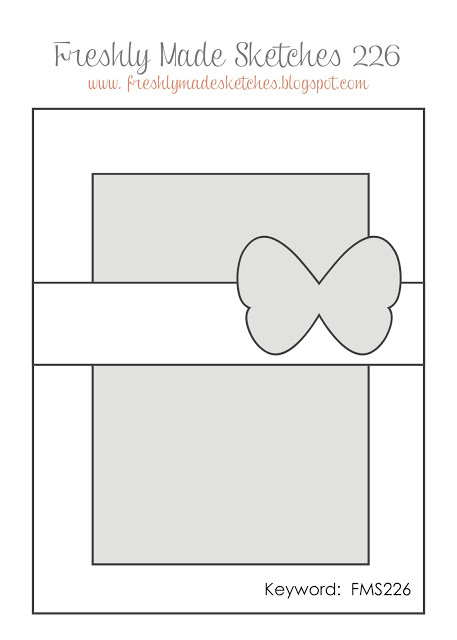 I loved this card since the first time I saw it on the DT blog Sandy! Crisp. Fresh and polka dots! Perfect combination!